Many kinds of interstellar travel exist in the Realms. The most sophisticated forms of travel are actually possessed by the magic using races who (ironically) either have little knowledge of distant worlds, or have no desire to visit them. Transition from world to world is possible through various means of teleportation and planeshifting. The Kriar, arguably among the most technically advanced possess several interstellar transit systems— hyperlight normal space travel, timegates, and instantaneous point-to-point tessering or warping. The Kriar are one of a very few races that have achieved normal space faster-than-light travel through a means of mass-phase extrusion. This essentially allows them to create zones of "intertialessness" that allow instantaneous acceleration and decelleration. This also bypasses velocity/mass limitations imposed by standard physics. A side-effect of this technology is essentially the ability to suspend the effects of gravity and/or mass without disrupting the molecular structure of an object (antigravity/antimass). This underlying technology is the reason the why they can construct a semi-solid object over 1 AU across. Aside from the Kriar, the vast majority of the technical civilizations capable of interstellar travel use one of three systems: jump travel, hypergates, and hyperlaunchers. All three systems are based on the same principle but implement the solution in different ways. The core principle is that space is convoluted and not contiguous. These convolutions or "folds" occassionally touch one another. In the places where the folds touch are "weak spots". In the places where the fabric of space/time is less concrete it is possible (with the proper energies and fields) to cross-over or "jump" the conjuncted space. These folds are sometimes referred to as tesseracts, and the jump process called "tessering". Through means of "jumping" or "tessering" it is possible to traverse dozens and in some cases thousands or millions of lightyears. Unfortunately, folds interact in hyper-dimensions, meaning that more than one fold may touch in a given area. The result is that navigating fold-space can be somewhat problematic (as you might not end up where you expect to go). There are means to more accurately "aim" the jump which is what seperates the more advanced races from the less technically evolved. For an account of jump ships in the Realms see the story Gold Rush. The Kriar, who again are the exception rather than the rule, make use of a larger space/time concept of coexisting fractal space. The idea is that any two locations in space conjunct through a specific n-dimensional harmonic. By unlocking this harmonic it is possible to instantaneously tesser between any two locations in the physical cosmos. This process is called "analogue warping" and for the Kriar it is a miniaturized technology that can be utilized by specially modified individuals who can think and do "real-time n-dimensional warp math". This mechanism is what is also used for time travel. See analogue warp for additional details. The two other mechanisms for faster than light travel, hypergates and hyperlaunchers are more advanced (stable) forms of tessering. Hypergates are fixed installations which artificially and semi-permanently "bind" space between two points. 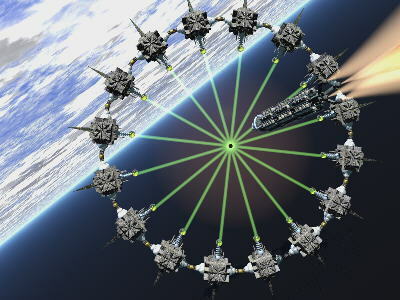 Typically, these are enormous space-platforms that require tremendous power to forcibly create the binding or "weak spot". A corresponding gate at the terminating side is required to make this process work. The most advanced races typically have a network of such gates which takes much of the guesswork out of hyper navigation. Such networks can take a civilization dozens of generations to build because in some cases it requires generation ships to actually travel to the target locale and build the anchoring hypergate. Some exceptionally advanced races have miniaturized hypergates so that they are planetary structures linking worlds. Hyperlaunchers are an alternate form of Hypergate, the main advantage being that only one installation need be built (a receiver installation is not necessary). These typically can send a ship to only one destination, but some of the most advanced forms can target dozens or even hundreds of locales. Typically, the hyperlauncher is built at a convergance of several space folds. Ships enter the launcher and it provides the energy and n-dimensional impetus to push the vessel through hyperspace (transition space). The multi-destination hyperlaunchers usually run on schedules hitting the various destinations available through harmonic "fold matching". The analogue warp is based on the idea that all space coexists simultaneously in any given physical coordinate. Thus the term "analogue" meaning alike (all space being in the same point). While two points don't actually occupy the same precise volume at any given cosmic moment, an affinity or "harmonic" between two locations can be created causing an instantaneous chronon-long exchange or "swap" that takes place in zero-time. This mechanism makes it possible to instantaneously tesser between any two locations in the physical and metaphysical cosmos. The mechanisms enabling this technique have been miniaturized by the Kriar and it can be utilized by specially modified individuals who can think and do "real-time n-dimensional warp math". A variation of this mechanism can also be used for time travel. Analogue warping is depicted in the Shaladen Chronicles novels.